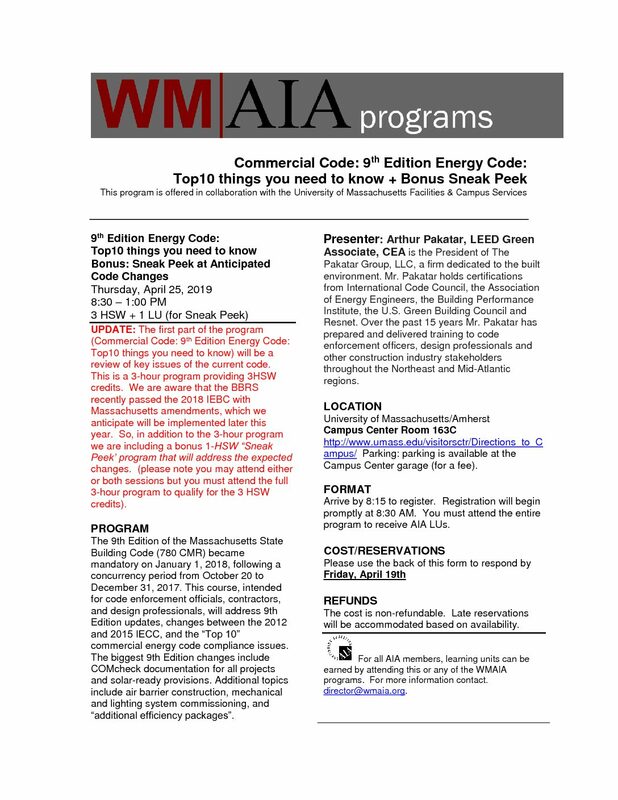 UPDATE: The first part of the program (Commercial Code: 9th Edition Energy Code: Top10 things you need to know) will be a review of key issues of the current code. This is a 3-hour program providing 3HSW credits. We are aware that the BBRS recently passed the 2018 IEBC with Massachusetts amendments, which we anticipate will be implemented later this year. So, in addition to the 3-hour program we are including a bonus 1-HSW “Sneak Peek” program that will address the expected changes. (please note you may attend either or both sessions but you must attend the full 3-hour program to qualify for the 3 HSW credits). The 9th Edition of the Massachusetts State Building Code (780 CMR) became mandatory on January 1, 2018, following a concurrency period from October 20 to December 31, 2017. This course, intended for code enforcement officials, contractors, and design professionals, will address 9th Edition updates, changes between the 2012 and 2015 IECC, and the “Top 10” commercial energy code compliance issues. The biggest 9th Edition changes include COMcheck documentation for all projects and solar-ready provisions. Additional topics include air barrier construction, mechanical and lighting system commissioning, and “additional efficiency packages”. Presenter: Arthur Pakatar, LEED Green Associate, CEA is the President of The Pakatar Group, LLC, a firm dedicated to the built environment. Mr. Pakatar holds certifications from International Code Council, the Association of Energy Engineers, the Building Performance Institute, the U.S. Green Building Council and Resnet. Over the past 15 years Mr. Pakatar has prepared and delivered training to code enforcement officers, design professionals and other construction industry stakeholders throughout the Northeast and Mid-Atlantic regions. * Registration will begin promptly at 8:30 AM. You must attend the entire program to receive AIA LUs.